This is a case where the plant's scientific name agrees with everyday common usage. The scientific name for these plants–Ginkgo biloba (or simply Ginkgo)–is more commonly used than the common name, "maidenhair" trees. The alternate spelling, "Gingko" is more in line with how people pronounce the name of the tree. Ginkgo biloba is a broadleaf, deciduous tree. The plants are also classified as conifers and are considered dioecious, meaning that some are male while others are female. Typically, knowing that a species has distinct male and female members is when achieving pollination is important, but that is not the case with maidenhair trees. Ginkgo biloba trees (the species plants as opposed to the cultivars) reach 50-80 feet or more in height, with a spread of about 30-40 feet. They grow at an average rate: about one to two feet per year. But form, height, width, lifespan, and growth rate are all dependent on the cultivar you choose to grow (see below). The bark on older specimens becomes deeply furrowed. The uniquely fan-shaped leaves start out green but change to golden-yellow fall foliage. Before the whole leaf turns golden, there is sometimes a stage during which the leaf is two-toned, with separate bands of gold and green. The common name "maidenhair" was inspired by the fan shape of the leaves, which reminds people of maidenhair fern (Adiantum spp.). Since the leaves are small (three inches across), they do not make as much of a mess when they drop as do the leaves of, for example, oak trees. Males have pollen-bearing structures for reproduction that are similar to catkins. Females produce balls, each of which contains a seed; they are covered by a soft, yellow exterior. Despite their fleshiness, these balls are not technically considered fruits, although people refer to them as such in everyday speech. While you should plant these trees in full sun to partial shade, they are not fussy about their soil as long as you grow them in well-drained loam that's kept evenly moist. Native to China, Ginkgo biloba trees, broadly speaking, will grow well in planting zones four through nine. They are famous for their use in medicine (see below). 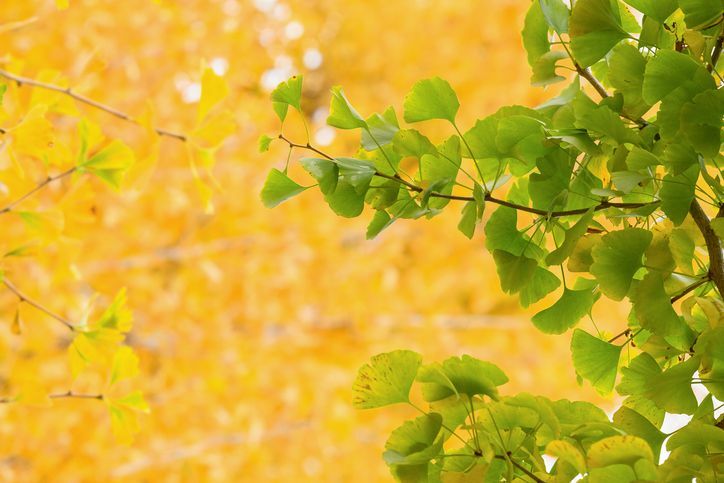 Ginkgo biloba trees are attractive enough to be used as specimen plants in your landscaping, particularly because of their golden fall foliage color. They are more tolerant of compacted soil than many trees are. They are also disease-resistant and tolerate urban pollution. All of these qualities–along with their small leaves–make them good choices for planting along city streets, where they can grow into tall shade trees. At the other end of the spectrum, they are also used for Japanese bonsai. Many types start out narrow while young but then become quite wide as they age. You can slow down this process a little by pruning them while young so as to force them to produce a single leader. But a much better solution is to select a cultivar known to have a narrow shape (see below). Whether for city streets or for people's yards, the male trees are preferred (unless you have allergies), because they are fruitless. Female trees bear a fruit-like product that not only emits a foul odor but also is slippery when it drops down on sidewalks or driveways. Cleaning up after female Ginkgo biloba trees is a high-maintenance task. The problematic "fruit" is about the size of a cherry tomato. Fortunately, all-male cultivars have been created through grafting. Buying one of these cultivars gives you a way to experience the beauty of the tree while avoiding the mess. All of these male cultivars will grow best in full sun in the North (partial sun in the South), have average water needs, and stand up well to road pollution, including road salt. In fact, as salt-tolerant plants, they are good choices for those who landscape near the ocean. All bear golden fall foliage, as well. 'Autumn Gold' is one popular male cultivar. It is meant to be grown in zones three through eight. Autumn Gold becomes 40-50 feet tall, with a spread of 25-30 feet. It has a broadly spreading canopy. A male tree of similar size and shape is 'Saratoga' (zones four through eight). What makes this cultivar different is the V-shape of its leaves, which strays from the usual fan shape. Princeton Sentry matures to stand at 40-50 tall. It is narrow, but not as narrow as Fastigiata, reaching 20-30 feet wide. Grow it in zones three through eight. Fairmont is another very skinny tree, reaching at least 50 feet in height by just 15-18 feet across. But it is not as cold-hardy, being suited only to zones five through eight. For a small space, try 'Pendula,' a slow-growing male cultivar for zones three through eight. It has a stocky build and reaches just eight feet tall at maturity, with a maximum spread of 10 feet. While the cultivar name 'Pendula' normally means that the plant in question has a weeping form, in this case the form is more accurately described as umbrella-shaped. This is not the only case where homeowners are advised to shop for the fruitless cultivar of a tree, in order to avoid messiness. For example, 'Rotundiloba' is a cultivar of non-fruiting American sweetgum recommended for low-maintenance landscaping, since it lacks gumballs (sweetgum is another fall foliage champion). Botanical.com recognizes Ginkgo biloba as "the oldest living tree on the planet that's been used safely for over 3000 years," noting that this relic from dinosaur times "was nearly wiped out during the Ice Age everywhere except in China." The Ginkgo Pages website relates that those Chinese Ginkgo biloba trees were mainly found in monasteries "in the mountains and in palace and temple gardens, where Buddhist monks cultivated the tree from about 1100 AD for its many good qualities." Plant collectors in China from the West eventually were sold on the trees and brought specimens home. The tree's medicinal qualities are now recognized in the West, too. Treatment for short-term memory loss is just one of many medicinal uses for the extract that comes from the leaves of Ginkgo biloba trees.